I might post this link in the comment section if a couple pieces I read recently. Good lord some people can be sanctimonious in ways I never imagined. You’re right. It will be okay. 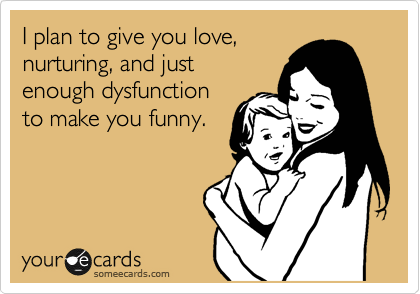 For sanctimonious mom, and for us. Somehow, it will be okay. my favorite part: “I don’t try to mask it by entrenching myself in my decisions as if they were gospel I needed to preach to the masses.”. So, so, so true. I may just post THAT on FB! The older I get, the more I realize how insecure it really is to judge people on Romans 14 issues (for non-Christians, those are things that are just different convictions of different people… like working vs. staying at home mothering, celebrating Halloween vs. ignoring it because you believe its evil)… silly stupid arguments that only cause division (and its especially hurtful within the body of Christ, because when Christians judge others, it gets really nasty). There are things that matter for morality, and then Romans 14 issues. Thank you for the reminder! I really needed to read this today. Not because I’m judging other moms but because I feel that I’m the one being judged all the time. I needed to hear that it will be ok, even if I mess my daughter up in ways that are very different from how my parents messed me up. I read all of those things that my FB “friends” post on parenting and I feel like I’m doing things completely wrong. I’m doing my best and I’m learning as I go. I’m also very insecure and second (and third and fourth) guess myself all the time. I hate it but it is what it is. It WILL be ok…I need to focus on that more than anything. Thank you for this today. I have to admit,this post made laugh. So true. Just, freaking spot-on!